The market for artefacts from full-sized railways is enormous with people collecting almost every aspect of their construction and operation. The four major railway companies of the 1920s and 1930s, the London Midland and Scottish Railway (LMS), the London and North Eastern Railway (LNER), the Southern Railway (SR) and the Great Western Railway (GWR), all attract a strong following even today, with items pertaining to the Southern Railway often attracting a premium at auction. 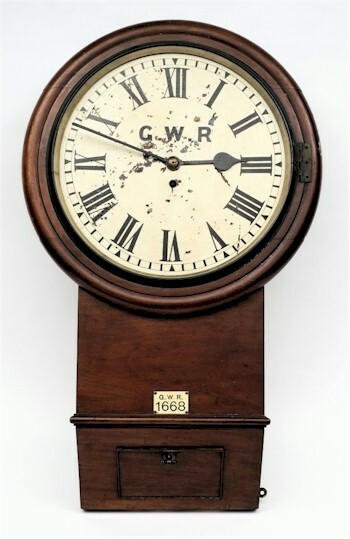 A Great Western Railway (GWR) mahogany cased single fusee station clock from Exeter St David's Station (SC21/1049). The items sought is endless: tickets, instruction manuals, labels and signposts, signalling equipment, lamps, signal arms and cast iron warning signs are very popular. However, staff uniforms, tunics and badges are equally attractive. 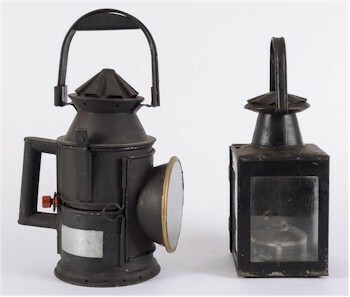 A 19th Century German signalman's lamp of typical form with sliding coloured glass shades together with a later British Rail square signal lamp (SC20/1201). There is something of a premium for locomotive nameplates and cab number plates as these are naturally limited in supply and are often keenly fought over in auction rooms. While items relating to British Railways (BR) and the diesel era is less sought after, this is slowly changing as people start to mourn the passing of diesel work horses in favour of High Speed Trains. 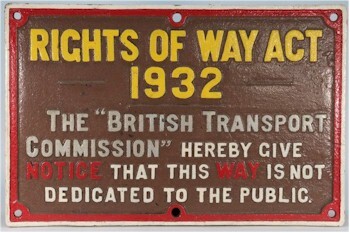 A cast iron British Transport Commission Rights Of Way Act 1932, adapted from a GWR design, 41 x 62cm (SC20/1205).